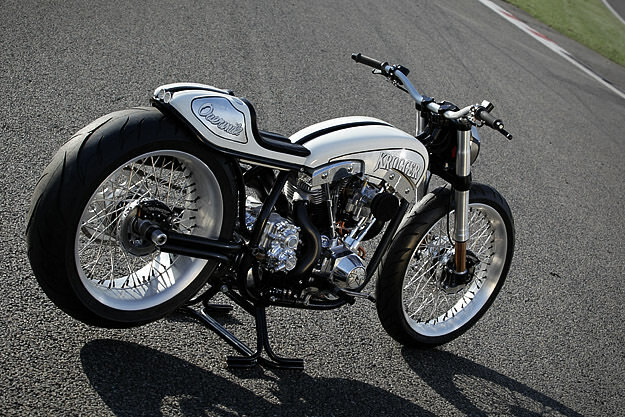 Celebrated Belgian bike builder Fred Krugger has taken the wraps off his latest custom. ‘Overmile’ is a tribute to Krugger’s favorite motorcycle, the Harley-Davidson XR-750, and it’s just arrived in Sturgis for the World Championship of Custom Bike Building. The finish on this machine is gorgeous: like Goldammer’s 2007 Nortorious, it’s a modern take on classic style—and shows the way ahead for custom building. Overmile has a distinctly Franco-American flavor: a 103 ci (1687 cc) S&S V-Twin drives through a 6-speed Baker PowerBox with overdrive, while other key components are French, including the Beringer brake system and Fournales shocks.